A friendly customer service representative will ask you a few questions about your home. We are always happy to review the duct cleaning process with you, as there are many companies doing many different things. With this information, we will then give you the final cost. Our price always includes cleaning the whole system. We clean all cold air and heating ducts, main trunk lines, and the furnace. For larger homes with 2 or more furnaces, we may need to set up an appointment to quote the job, still with absolutely NO fee. 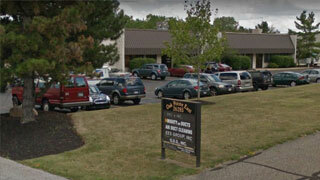 You can have peace of mind knowing our quotes are exact. The price you’re stated, is the price you’ll pay. The first thing Mighty Ducts’ experienced, two-man crew will do when they arrive at your home is take steps to protect it. A clean worksite is the sign of a professional. Our technicians will lay down tarps and padding in all the sensitive areas of your home. They will wear protective booties over their shoes to ensure your home stays clean while they work. We have designated inside hoses and outside hoses. The cleaning process does not begin until the high-powered vacuum is started and connected to your duct system. At this point, any dirt or dust from your home is trying to go towards the vacuum and hopper outside rather than the other way around. A clean home is a healthier home. At Mighty Ducts, our experienced crew will go above and beyond expectations to make sure your home’s entire ventilation system is clean to your satisfaction. We even back it up with a guarantee. We arrive at your home driving a big box truck, usually with 2 technicians. 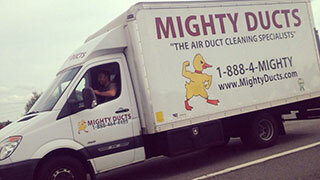 As this is our sole business, all the equipment on the truck is dedicated to duct cleaning. The technicians will first inspect the ductwork and furnace to discover if there are any problems with the system. The furnace, or air conditioner, will be turned off/locked out. We set up and start the gas-powered, industrial vacuum outside your home. Access openings are made on both the cold air and heating ducts plenums near your furnace. We then run an 8″ diameter hose from the vacuum through a door or window and attach it to these openings, usually starting with the cold air side of the system. We block all registers on that side of the system by covering the register grills with paper in order to isolate the single vent that we are cleaning. This creates the necessary vacuum needed to thoroughly clean each vent that we are working on at the time. While the vacuum is pulling, the other technician goes to a register and pushes or pulls the dirt toward the vacuum at every vent using air assisted whips and rods. The paper is then removed from the next vent to be cleaned and placed over the one that is finished and the process is repeated until each vent is cleaned. We then clean the other side of the system, the same way, one at a time. To ensure that no debris is left sitting in the long horizontal trunk lines, they will be whipped out separately. Your furnace is an important part of your air duct system. We will thoroughly clean the components of your furnace and air conditioning that air passes through. We will also sanitize the furnace with a safe solution (it’s safe for everyone, including children and pets) to kill mold, bacteria, dust mites, and other allergens that might be present. This step makes your home an even safer place to live. Our trained technicians will inspect your system to ensure it has been throughly cleaned. All access openings that were created in your system are sealed professionally with the same grade material as your existing ductwork. Trunk line openings are closed with special plugs made especially for this purpose. Your system is made air tight, returning it to like-new condition. The system is then turned back on and tested to ensure that it is working properly. The working area is cleaned and swept. Payment in the form of cash, check, or Visa/Matercard is collected upon completion.